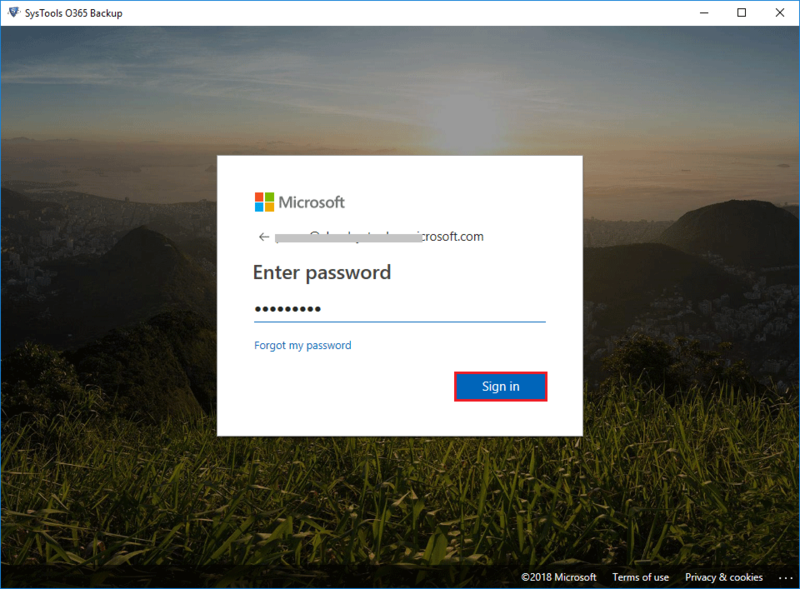 The Exchange Online backup mailbox permit users to keep single as well as multiple items of the MS Office 365 domain to a desktop server. 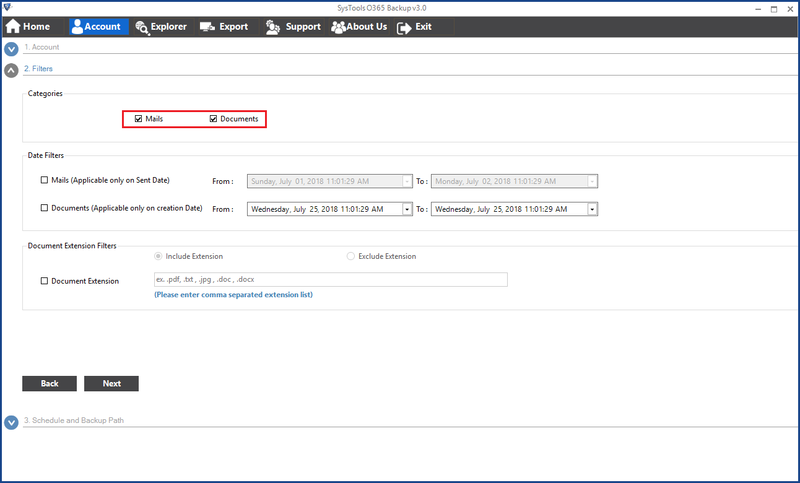 This software also provides an impersonation option (only for admin users) that allows the administrator to migrate multiple mailboxes from Outlook 365 domain. 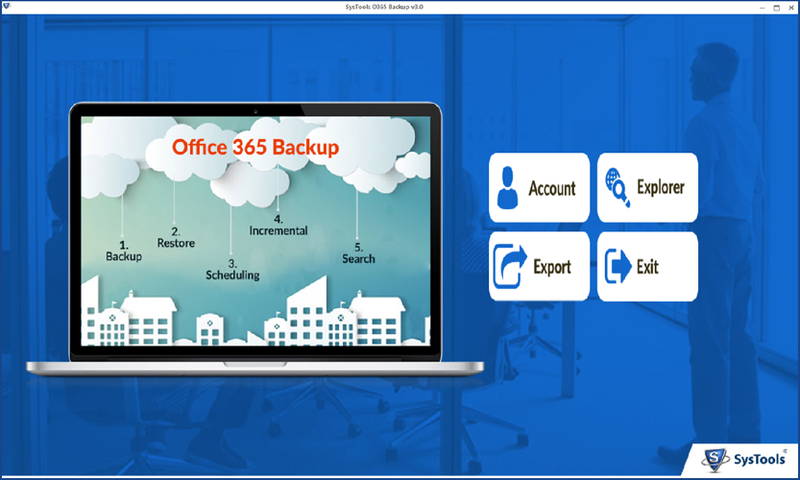 Office 365 backup software is designed to move Exchange Online archive mailbox to PST as well as EML file format which is created and stored on a local machine in the sort of Outlook data file & an email respectively. As a result, auto-mapping, saved & transferred each data individually when users start export Office 365 mailbox to PST file process. Users to carry out and managed the Office 365 email backup solution to Outlook PST and EML type. Even users can migrate data from Exchange Online mailbox in a selective manner. It meant if users do not want to migrate complete data items, then they can apply different available filters like email filter, date based filter and backup selctive emails from exchange online mailbox. Microsoft Office 365 backup always let to download the data and maintains the folder hierarchy even after exporting or importing the data from Outlook Web App (OWA) to a hard drive. Further, there is no change in the formatting of PST file when it is saved on the local machine. However, office 365 exchange backup keeps all attributes of PST file and provides an ease to access the data. When saving Office 365 data to EML file type, the Outlook 365 backup software allows the naming convention to be chosen. Users must specify the particular name, which they want to save the output in the results. The Office 365 mailbox archive has done in bulk yet to choose the naming patterns with message subject or different attributes that will be applicable to all. Note: If users want to export Office 365 mailbox to PST format then, there is no file naming convention available. Complete data of user account is transferred while downloading the Exchange Online mailbox. Thus, the office 365 exchange backup software can save Outlook 365 Emails, Contacts and Calendar to PST as well as EML format. During the migration, all data items to be selected automatically. Storage of a particular data is done in an archive folder within an output PST file. How can I backup exchange online mailbox to pst using this software? Can I easily export multiple mailboxes from Office 365 to hard drive on my local machine at a time? Yes, the Office 365 backup software is organized to support both single as well as multi-user account's local archive. Moreover, the office 365 exchange backup tool offers impersonation option which permits the admin to export all mailboxes from Office 365 domain. Does each user enable to access their PST file after moving individual PST file with this Exchange online backup software? Yes, Of course, our product can easily export individual Outlook data file corresponding to each user's account. Hence, no need to manage the .pst file accordingly as the Office 365 Exchange backup. For what reason Impersonation feature is given? Impersonation option is limited for admin users only, so if they want to transfer complete user mailbox of Office 365 profile then, this option can be applied. Also, makes able to backup different account by adding the required user list within the office 365 backup software through the CSV format. Does Office 365 backup tool provide an option for choosing an appropriate naming pattern during the migration process? Yes, the Exchange online to pst software allows the user to export all emails with any desired name by applying file naming convention option. Does the software retain the folder structure during exchange online backup and restore process? Yes, the Office 365 Exchange backup email will maintain the folder hierarchy even after the data has been exported from exchange online to pst on system hard drive. 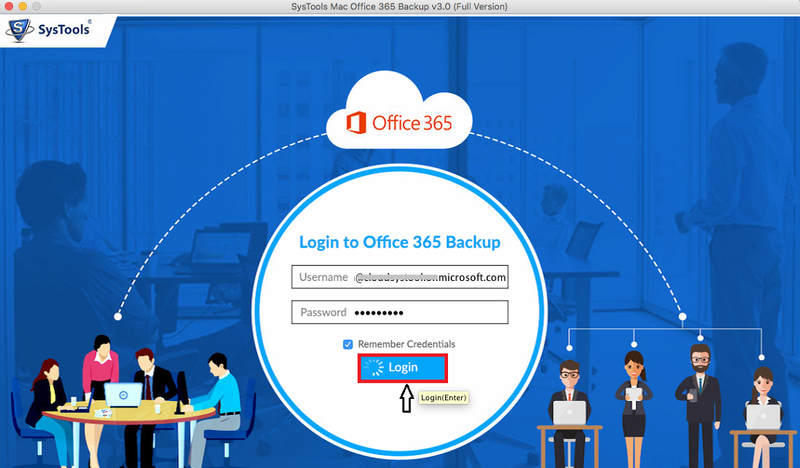 Launch Office 365 Backup Software v3.0 and Click on Account button for login into Office 365 Account. "Office 365 backup software that is programmed to export Office 365 emails in different file types such as PST and EML format. 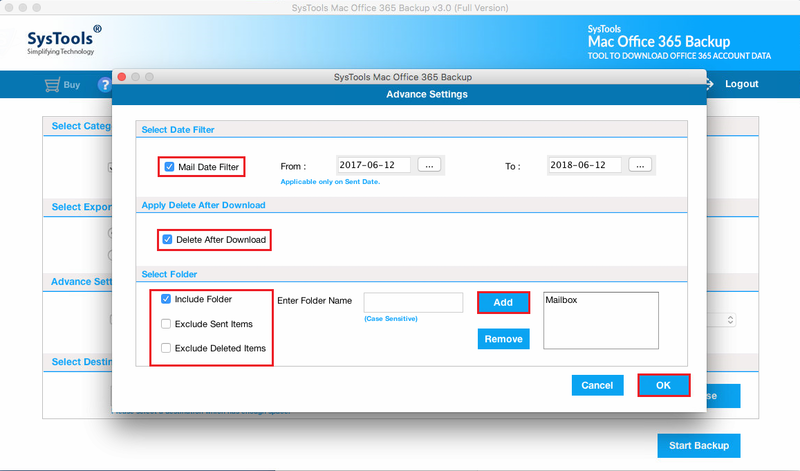 Users can select any of the two options to backup Office 365 mailboxes and save them on the source machine. I am very impressed from this utility as it is very reliable and efficient for Microsoft exchange online mailbox backup and restore solution. Kudos to the software development team for creating an awesome product." "Last few months, I was looking for the best and trustworthy software to archive Exchange online mailbox to the local drive. Then, I came across this wonderful software and I must say that I am really satisfied with this application because it made me to take backup exchange online mailbox to pst file format!!". "I was searching solution for Microsoft exchange online mailbox backup and restore. Luckily I landed to this Office 365 Exchange backup software page. Simply I download free demo version to analyse the working features of this tool. The demo version worked well and then I availed its full version. The support team helped me throughout the backup process.". 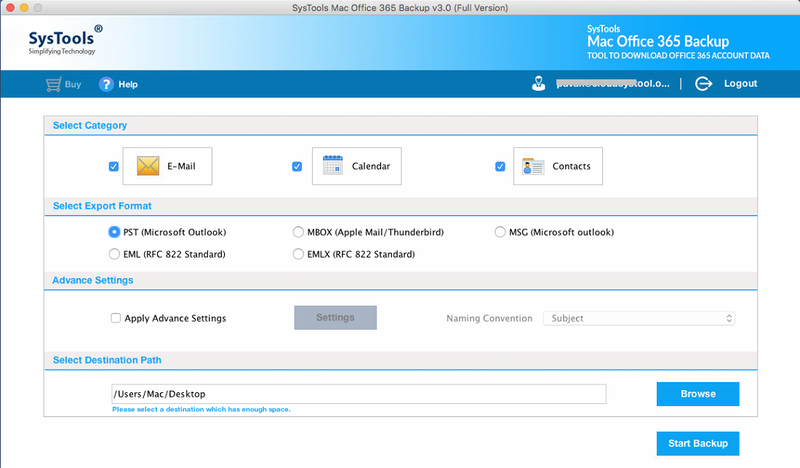 Office 365 backup solutions for Mac tool takes a backup of exchange online data in the local machine. For this purpose, the tool allows to export their Office 365 data to PST format as well as EML, MSG, EMLX, and MBOX format. Users are free to choose any of the options according to their need. With the help of Mac Office 365 Backup Software, users can export their all mailboxes of Office 365 to Outlook PST file. However, the tool is capable to extract data items such as emails, contacts, and calendars from a computer or hard drive without any hassle. This application has an option to apply date based filter. This feature is very helpful in that condition when users do not want to take a backup of all data. Because, with the help of this tool, you can download selective data within the specific date range. 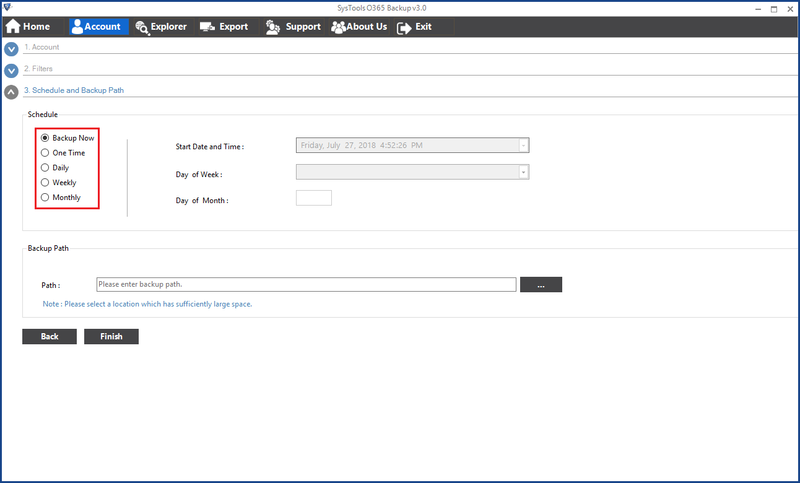 And export only selected exchange online mailbox to Outlook PST format. When you have downloaded any file in your desired format and after downloading you need to eliminate this data from the server. 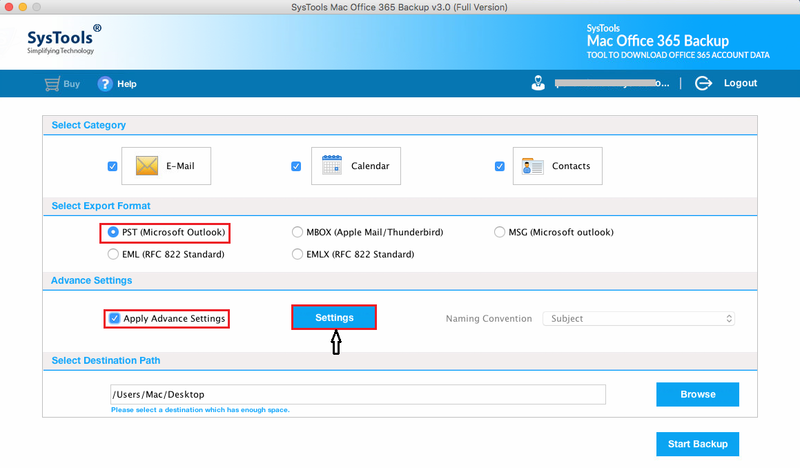 In this case, Mac Office 365 Backup tool will help you to take backup of exchange online mailbox into pst, msg, eml, emlx and mbox format. After that remove emails and free up some space for adding the new data. The exchange online to pst export tool provides pause and resume button. If you want to stop your backing up process in between then you can use pause feature. After that, for restart the office 365 mailbox backup process again from where it was last stopped, you can choose Resume button. 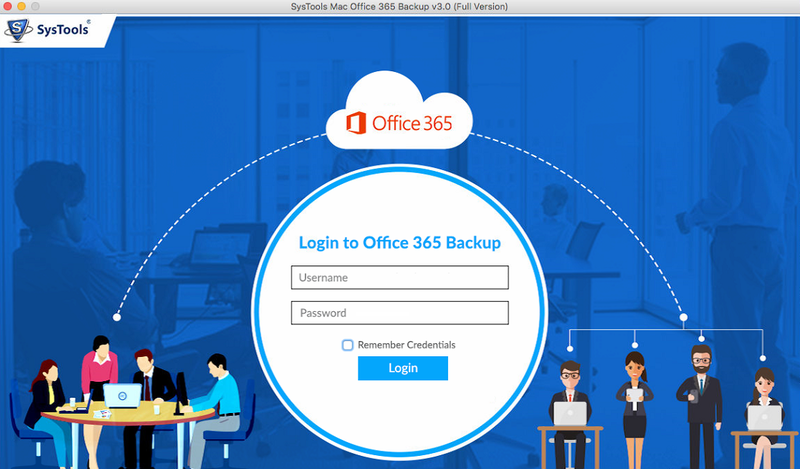 The Office 365 backup for Mac tool is designed in such a manner that it is compatible with all latest versions of Mac OS such as OS X Yosemite Version 10.10.4 & 10.10.5, Mac OS Sierra Version 10.12.3. In addition, it provides a simple and user-friendly interface that is understandable by almost every users. Does the tool able to take a backup of multiple Office 365 files at once? Yes, you can easily take a backup of all Office 365 mailboxes to Outlook PST format in bulk without any data loss. Can I export some selective data from Office 365 to PST? 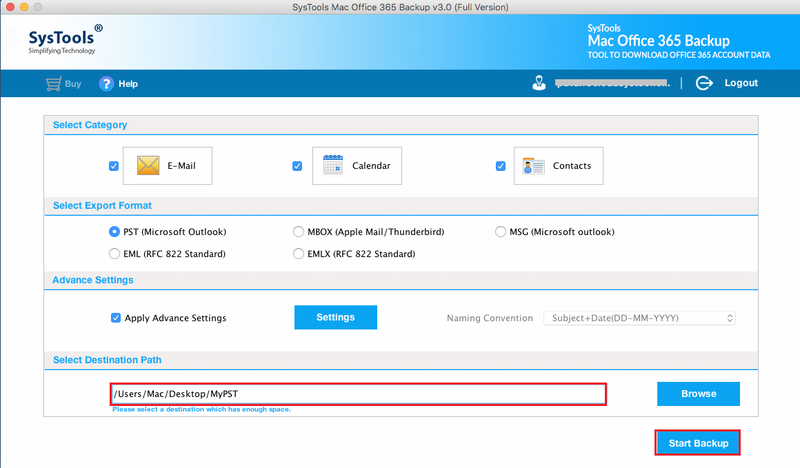 Yes, the Mac Office 365 Backup tool has an option to apply date based filter and migrate selective data from exchange online export mailbox to pst as well as EML, MSG, MBOX, EMLX format. Does the application compatible with Mac OSX 10.10? Yes, Office 365 Backup for Mac application supports Mac OSX 10.10 and its all later versions. 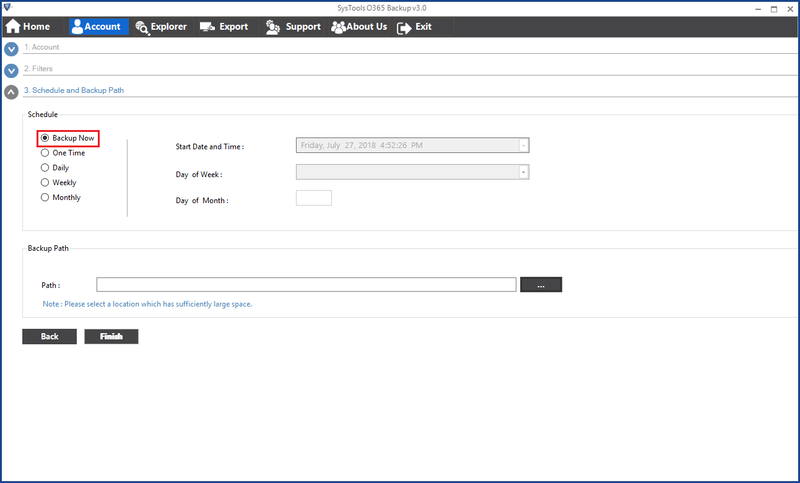 And help users to Microsoft exchange online export mailbox to pst. Is it possible to export contacts and calendars from Office 365? 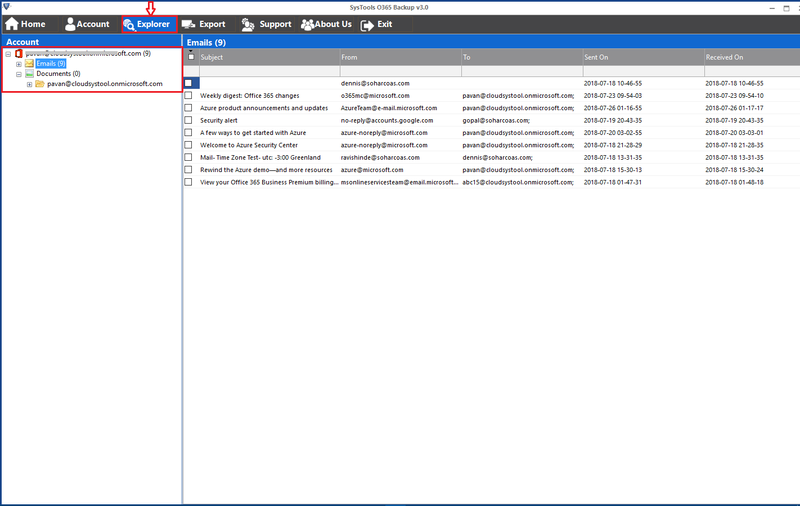 Yes, the tool provides an option to take a backup Office 365 Emails, contacts, calendars to PST, MSG, EML, EMLX, and MBOX file format. 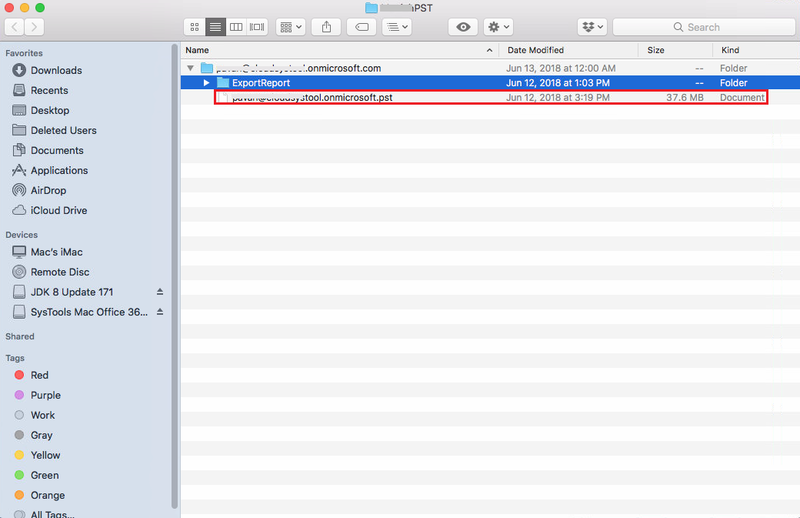 Is the software capable to export office 365 mailbox to apple mail? Yes, the exchange online export user mailbox to pst software have capability to convert office 365 to MBOX format on Mac OS Machine. Which can latter on import in Apple Mail, Mac Mail etc. 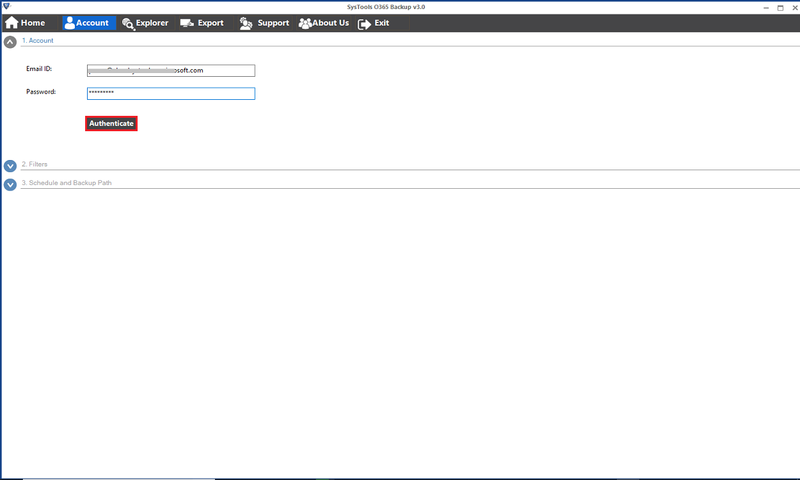 Along with this the tool can also convert office 365 to EML, EMLX, MSG and PST format. On the next menu select the file format in which the backup would be created. Select one option from PST, MBOX, MSG, EML or EMLX. Select the radio button corresponding to "PST" labeled text. 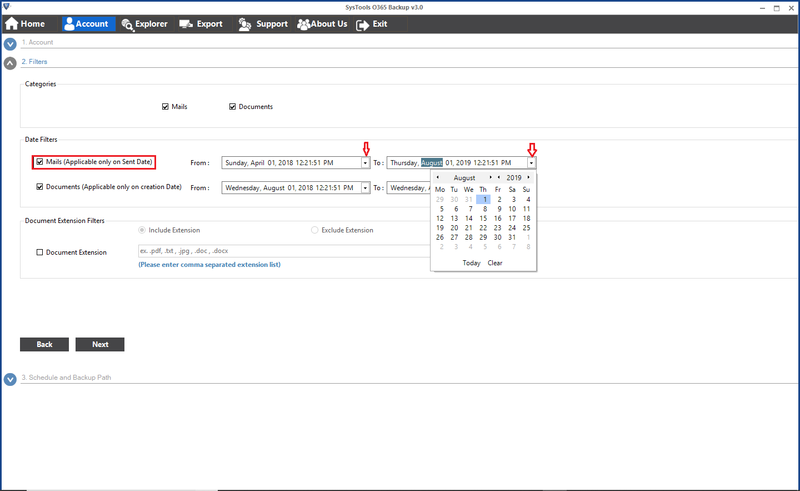 CheckBox beside "Apply Advance Setting" & Click on "Setting" button to apply customized filters. 1. 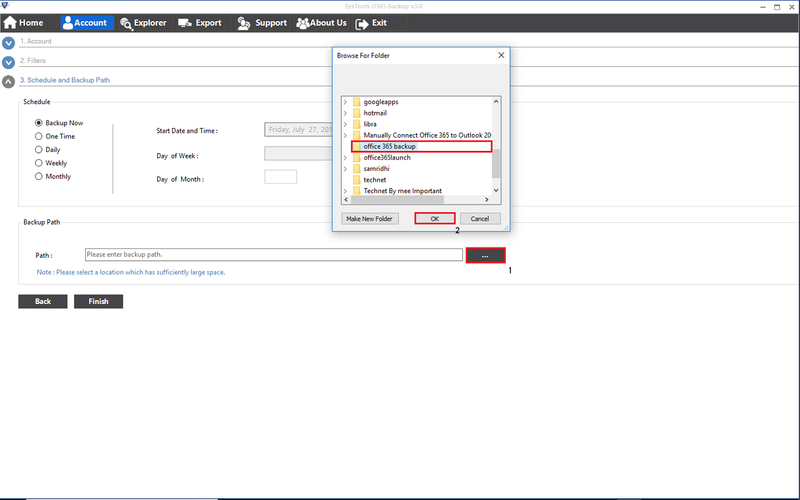 Include Folder: This option is to backup only the selected Mailbox (one or more then one mailbox can be added). 2. Exclude Sent / Delete Items: In case don't want to backup deleted / sent items one can exclude using this option. Click on the "Browse" button to browse the final destination for the backup process. By Default, software choose "/Users/Mac/Desktop" Path. At the end click on Start Backup button. The software will now start the process. Also you can apply the “Incremental Backup:” If you have backup Office 365 account earlier also, then incremental backup option window pop-up. Depending on your choice, you can select Yes or No option. For example, here NO option is selected. 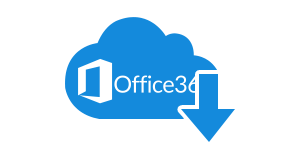 "I was searching solution for taking Office 365 mailbox backup and restore on Mac platform. Fortunately, I came across this wonderful software. This tool helps me a lot in exporting exchange online mailbox into Microsoft Outlook and I must say that I am really satisfied with this application. Great tool!!" 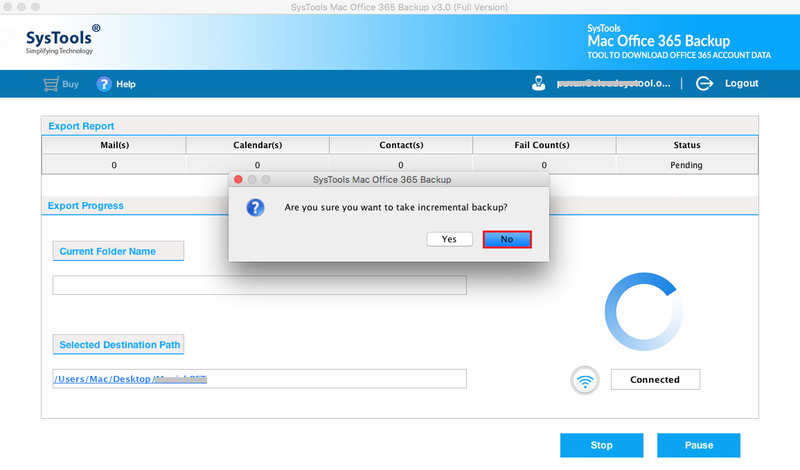 "I have tried so many Exchange Online Backup tools but I did not find the simplicity and flexibility in any other tool like this Office 365 Backup for Mac. Really, I want to say thanks to the developers for making such friendly and absolutely precise software." "Before using this software I had faced so many difficulties to taking backup from Office 365 account on Mac OS. But, I used this tool and it overcomes all challenges faced by me during Microsoft exchange online mailbox backup and restore backup process. Thank you so much developers. Keep it up!!"